Lavender has been grown for medicinal and culinary reasons for many centuries. Dried lavender flowers are harvested during the summer months when they are at their peak for perfume and properties. Here at Wolds Way Lavender the lavender flowers are steam distilled in our own lavender distillery to produce pure Lavender Essential Oil. Our lavender essential oil has medicinal properties including antiseptic, anti-inflammatory and analgesic. It also has the benefit of helping to calm and relax and is used widely in stress-related conditions. In the past the herbalists claimed lavender could be used to heal anything from colds and headaches to limb paralysis and neurosis. Lavender was also used as a tonic and a laxative. It has nerve simulating effects and can help with scar tissue repair and minimize scar formation. It is also good for acne. Our oil can be used to help with digestive disorders, in hypertension, headaches, insomnia, melancholia and dizziness. Lavender essential oil can be used to relieve menopausal symptoms by helping to balance the emotions. This in turn can help to alleviate the symptoms associated with the menopause such as “hot flushes”, palpitations and night sweats. A lavender wash can help to relieve cystitis. Lavender massage oil can be used for lumbago, sprains, rheumatism and muscular aches and pains. Asthma and bronchitis, exuberated by nervousness can be alleviated by using lavender massage oil or vaporized oil. Lavender oil is a circulatory stimulant with strong anti-depressant and analgesic effects. Lavender tea aids cramps, flatulence and colic. It can help with nausea: 1 tsp (5ml) to 1 cup water. Burns and scalds are treated with lavender and it is useful to have in a first aid box. Bruises and bites are treated with lavender. It can be used as as an insect repellant and is great for keeping flies away from horses. Our pure lavender oil can be added to dog shampoo. It helps to deter fleas as well as making the coat smell, look and feel wonderful! 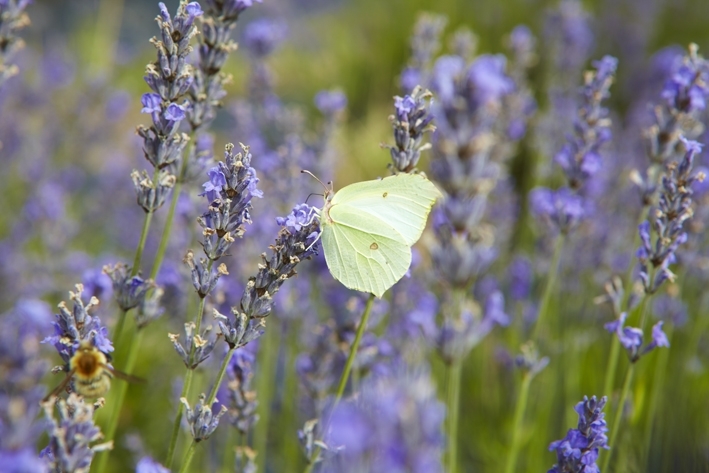 In Provence in 1874 blotting paper was soaked in lavender oil and used on schoolchildren to keep lice at bay. Lavender was used in World War One when disinfectant was scarce. It was used in field hospitals to combat infection, clean wards and purify dressings. Lavender is a versatile oil with many uses. As with all herbal remedies it is essential to have an accurate diagnosis before using as a self-treatment. As with any essential oil caution should be used when using lavender oil. Lavender is a circulatory and uterine stimulant and lavender teas should be avoided during pregnancy. 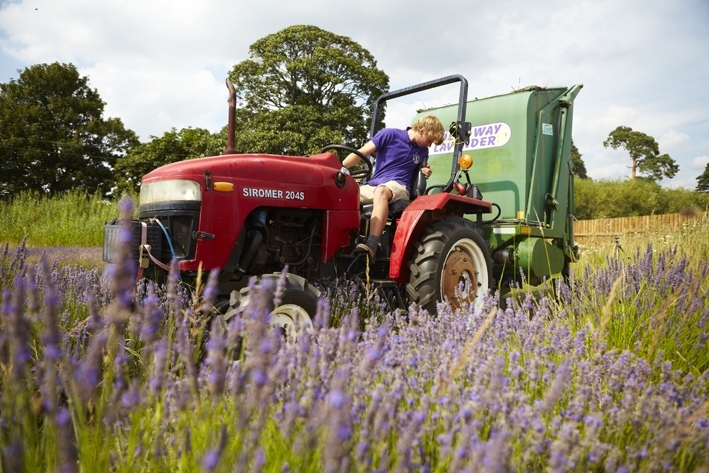 Our Lavender Oil is harvested and distilled under one roof and grown across twelve acres of beautiful fields on the edge the of the picturesque Wolds. The Lavender Essential Oil we create is 100% pure and we strive for the highest quality. We grow two varieties of Lavender and using traditional methods. We hand tend the crops throughout the year. We harvest and distil the flowers in August using the countries only wood fired steam distillery. The Lavender Oil that we produce is worlds away from normal products, that rarely often use actual lavender, favouring chemically produced aromas. This devoids the products of any of the medicinal properties that true Lavender has. As one of the most powerful oils which can be extracted, Lavender has a myriad variety of applications; it’s a natural stress reliever, it can help you get a good night’s sleep. It is a natural anti-septic and cleanser. Spraying it in a room will do wonders to freshen the air and it will even deter wasps! We use our Lavender Essential Oil to create a variety of wonderful products. You can find them all in our shop.